Written by Evgeniya Radilova, American Movie Company’s newest Teleprompter Speech Coach. Like most children, when young I loved to love. I was innocent, happy, and unaware of what pitfalls or for that matter what exciting experiences awaited me. I was curious to find out what the world around me had in store. I looked at everything through rose-colored glasses. I saw only beauty. As a child, I often felt as if I’d been thrown in the ocean not knowing how to swim. I feel sure you too must have known that feeling at some point in your life! Of course, a child depends on adults to guide and help understand the world. They, in essence, are in control. That is simply the way things are. As I grew up, I literally learned how to surf the waves through dedication and hard work. I learned to never give up. You see, there is a way! Now I am here to share my experience with you and by doing so hopefully to be of help. Most people believe that the very first sound a baby hears while in the womb is the mother’s voice and then perhaps the father’s. At the moment of birth he/she comes into the world with this pure and loud scream. Why it is so loud? Experts avow that it is because infants are completely free of any harsh feelings, judgments, likes or dislikes, opinions or wants. They are tabula rasa. At birth there are no innate ideas. There is simply a desire for love! There is only purity, total innocence. A first cry for life! From that moment on, learning begins. A baby becomes aware of its surroundings and begins to communicate in subtle ways. Behavior is observed and soaked up from family and friends. It goes without saying that environment plays a big part too. Everything affects a baby. It matters if parents speak to their newborn in a soothing, loving manner. It matters if they pay attention. This behavior will result in a positive experience. If, however, parents constantly scold and berate in a cold voice, if they don’t pay attention, then this behavior will result in a negative experience for the child. I’m certain I don’t have to mention the sort of irretrievable damage done if the parents or other adults abuse the child verbally or physically. Time passes. Babies grow up! They start to speak! In the process, fear creeps in. They crave acceptance. They want to look and sound like everyone else. They need to be needed. They get a bit lost when they start to care too much about what other people think. Peer pressure! I am afraid this feeling extends to adulthood. Personally, I have always searched for the truth, the deepest truth of who I am. What is my real voice? I believe it is a universal desire – to know who we really are! I attended the National Academy of Music. For eight years I studied piano. I played long concerts by Beethoven, Mozart, Chopin and others beautifully. However, I wasn’t good in music dictation. Every 30 seconds the teacher would play a chord and the students would have to hear it and write it down. I was really bad at this. While I was still thinking about the first chord the teacher was already finished with the exercise. I took it to heart. I already suspected that I couldn’t sing. This comment cemented it in my mind. Sure enough, I grew up with the idea that I could not sing. Through daily hard work I came to understand that I have a deep and velvety kind of voice. I am proud of it and what I have achieved. Comparisons with other singers are odious. I now know how to use it and create something beautiful with it. Am certain, you too can relate. One would think that as adults we would have it all figured out. We don’t. In most cases, we lose ourselves somewhere in our earliest childhood. Children are vulnerable creatures and their souls can be easily crushed. There are those who believe and expect, erroneously, a child of seven to know who he/she is and will become. The truth is that a child’s only concern should be playing and discovering at his/her own pace. In the “The Power of Play: Learning What Comes Naturally”, by David Elkind, he asserts that through play we give our children the freedom to find their own voice. For some, it takes going through high school, college, entering the work force and creating a family before finding their true voice for the first time. Adults finally recognize their own likes and dislikes. There is an awareness of not only what one likes but a clear perception of what to do in life. It is sobering to remember that who you once were, is not necessarily who you really are now. People evolve. Now, I am addressing you directly – Don’t be afraid to put your thoughts and passions out into the world. Everyone deserves to be heard and only you can do the work and learn to speak with your authentic voice. When I came to the realization and acceptance about what I like, everything suddenly made sense. I became present! I became fully aware of my body, voice, thought and feelings! I was grounded and at the same time ready to take off! Having said that, please remember that you will not be 100% yourself at all times. If you were, you would not be human. We are complicated beings. It is good to know that. 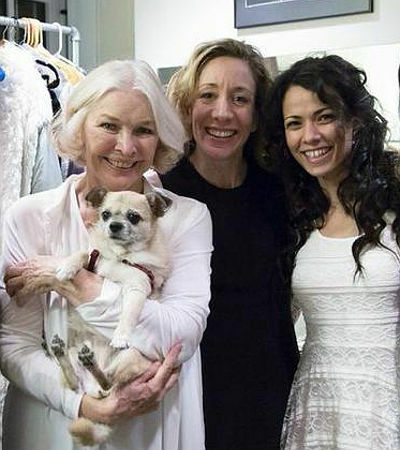 The Cherry Orchard, Ellen Burstyn, Evgeniya Radilova and friend. Even the most talented, successful, highly respected people have moments of self-doubt. A while back I shared the stage with the marvelous Ellen Burstyn in a production of “The Cherry Orchard” at the Actors’ Studio. I played her daughter. There were nights when the quintessential professional actress and some of us in the cast felt like we were “working”. It didn’t flow seamlessly. When inhabiting a character it should feel as though you are that character. Acting should not be forced. Sometimes it comes naturally and sometimes it doesn’t. This is when “technique” comes in. Reliance on past experience and knowledge of the craft is of value. Again, even Ellen Burstyn, one of the most acclaimed actresses in the world, is not always on point, as it were. On that particular night she voiced, ” I felt like I was working tonight! This was surprising to some of us but at the same time it was wonderful because it was real. She used her technique and was brilliant, of course! The lesson to be learned here is not to give in to negative thoughts. I encourage you to soldier on. Even if you don’t feel like you are at your best, persevere – there is a way to be your best. Own your own potential. Embrace it! I will help you learn techniques to enable you to express yourself to the fullest and make a lasting impression!